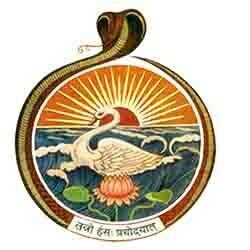 The emblem of the Ramakrishna Order designed by Swamiji is a unique and unparalleled work of art created by one of the richest minds in contemporary history in an exalted mood of spiritual inspiration. It is a profound symbol of harmony and synthesis for reverential meditation in this present age of conflict and disharmony. This symbol is the epitome of Swamiji’s message of harmony and synthesis, leading to life’s fulfilment. This is indeed the most eloquent expression of what he really preached, what he wanted every man and woman to be, to realize, either in the East or in the West. The goal is to realize, even in this very life, one’s real Self, the self-effulgent Atman, the Swan in the emblem and through this realization to be free of all limitations, all bondages, all littleness. This spiritual freedom is one thing to be aspired for and achieved in this very life. It releases one from one’s prison-house of limited individuality and confers upon him or her, the blessing of universal existence. He then becomes one with Existence-Knowledge-Bliss Absolute. ‘Be free. This is the whole of religion’ said Swamiji.